For day 2 of our 14 day colour challenge, you will be playing with the colour black. Drama, Grief, Delight and Joy are the words I’ve associated with this colour. You can pick one word or try and incorporate as many as you want into your composition. I decided to share a few photos for day 2. My first photo focuses on delight and joy. 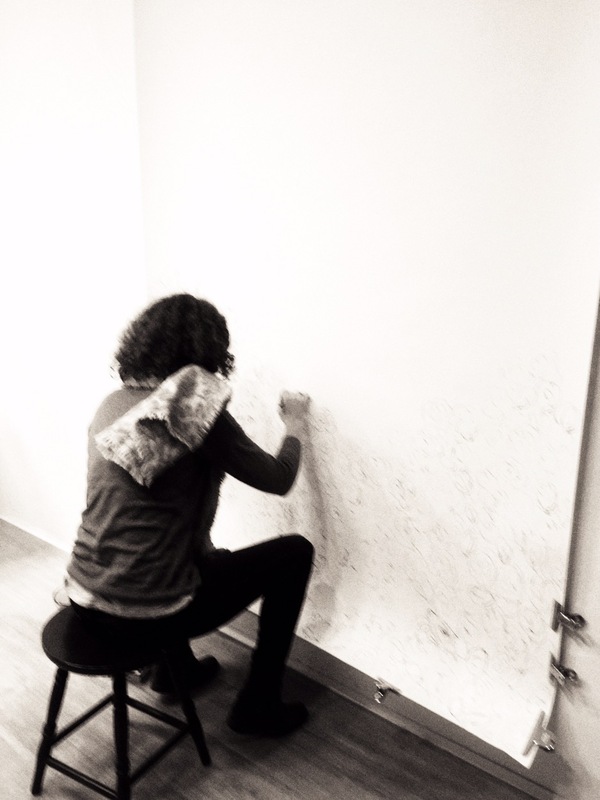 The photo is of Jenny Schminke who has been at the Friday Gallery working on a large scale paper piece. Jenny is studioless right now and I know what that feels like so I offered Jenny a wall at the gallery to work big for a few days. Jenny has been enjoying the freedom that comes with space and has been happily sketching the first of a series of large scale drawings. The image below is of the new snowfall on one of Munich’s cobblestone streets. Snow for me is a joy/delight but it also symbolises grief/death. The earth sleeps and rests waiting for spring buried under the white and exposing only the essentials; The earth is “dead” waiting rebirth. In my photo black is buried under the white but, always there… good/evil/ day/night. Lets dig deep, or not. It is your choice when playing with black. If you are taking part in this challenge you are welcome to post your image/artwork on our BCA Munich Artists Challenge page or as a response on our Munich artists post on Facebook. Look forward to seeing black today.